Chicano-Indian center to relocate By GEORGE SHIRK Staff Writer Although members of the Chicano-American Indian Center had planned to move their center from its present location at 155 N. Clinton St. to 308 Melrose in mid-August, their move has been delayed until the university completes renovation on the new center locations. A date for the move is still uncertain, but Arturo Ramirez, L1, anticipates the new center will be open by late October. Reaction of center members to the move is mixed. The newer building will provide more office space, but at the cost of decreased access to students, Ramirez said. University officials requested the move because the Clinton Street house, which was rented to the center by the university, is slated for demolition. Presently, the university is accepting estimates on renovation necessary for the Melrose Street location. Remodeling will include the removal of several walls, and painting and installing new locks and kitchen facilities, according to Richard Gibson, director of facilities planning. The activities and programs of the center are numerous. Action is aimed at concentrated Chicano or Indian populations. Of the 20,000 Chicanos in Iowa, there are 80 now enrolled at UI. Five Indians are currently enrolled. The center provides academic counseling and assistance, as well as an atmosphere which Ramirez describes as one which "affords an escape from subtle prejudice." 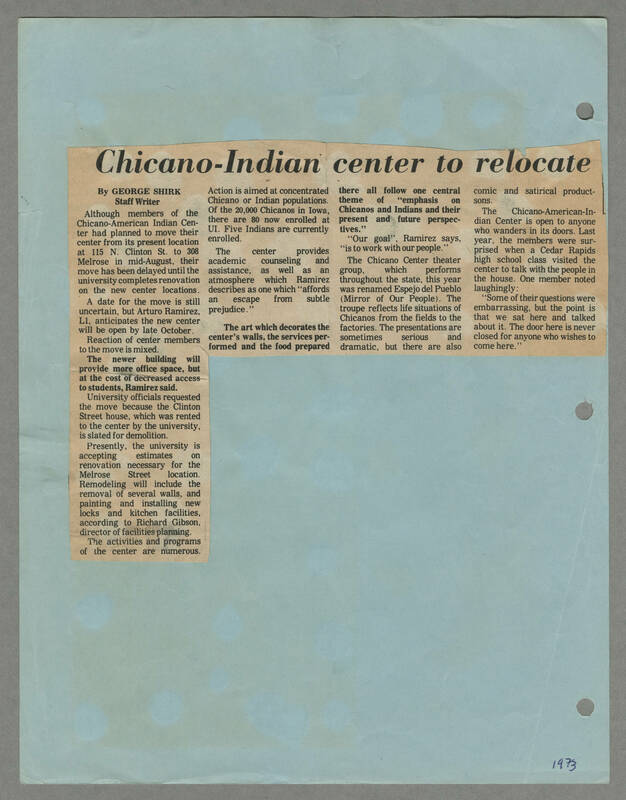 The art which decorates the center's walls, the services performed and the food prepared there all follow one central theme of "emphasis on Chicanos and Indians and their present and future perspectives." "Our goal", Ramirez says, "is to work with our people." The Chicano Center theater group, which performs throughout the state, this year was renamed Espejo del Pueblo (Mirror of Our People). The troupe reflects life situations of Chicanos from the fields to the factories. The presentations are sometimes serious and dramatic, but there are also comic and satirical productsons. The Chicano-American-Indian Center is open to anyone who wanders in its doors. Last year, the members were surprised when a Cedar Rapids high school class visited the center to talk with the people in the house. One member noted laughingly: "Some of their questions were embarrassing, but the point is that we sat here and talked about it. The door here is never closed for anyone who wishes to come here."